It was joke day at Big Kid's school yesterday and he was reviewing his material over breakfast, trying to find the perfect joke to share. "Do you got any jokes, mom?" "Hmmmmm, not really. What's black and white and red all over?" "A penguin in a blender!" His face flickered from confusion to disgust before he began laughing uncontrollably. Once he calmed down he shook his head and stared at me. "You know that would not be appropriate, right? There will be kinnagardeners present. I hope you know better, mom. That's pretty sick and discustin'!" "Yeah. You probably shouldn't take joke advice from me, but I see that you already know that." "It was funny but not for little kids, ya know? You probly shouldn't be talkin' 'bout blendin' up penguins in front of people younger than first grade. Or maybe even not at all, really!" Later that night, he had a school assembly. It was cute but I didn't see much of him--not because of obnoxious parents this time but because there was a much funnier child sitting closer to where I was. At each song's chorus, this little guy would scream the words at the top of his lungs. As the audience began giggling and the focus began shifting to him, he really amped it up by adding his own dance moves. He had just completed a 360 degree turn of full pelvic thrusts that would have made Elvis blush when the vice-principal hopped up on stage and whispered into his ear. His little face fell and all of the parents groaned in disappointment; a nearby dad whispered,"There goes the entertainment!" He was determined to continue, but the vice-principal had predicted that and hid behind a Ficus tree on stage. The little boy would start grinning and getting antsy, clearly coming up with a plan, when he'd remember and turn around to see if she was still hiding behind the potted plant. She always was. He still got out a few yells and some hip wiggling, but she put an end to the majority of his theatrics. I know I wasn't the only one who was disappointed. We're taking the kids to Busch Gardens this weekend! Florida people, you can get a free 2010 pass for children under 5. We are all looking forward to it but little kid is SUPER DUPER can't-talk-about-anything-else-making-it-impossible-to-get-stuff-done excited. Haha, you & my husband tell the same type of jokes. Mr. Ashley will be thrilled when you start wanting to add a baby hippo to the mix! Thanks for the heads up on Busch Gardens. I just passed it on for a friend's daughter. Awwwwe, that baby hippo is so adorable!! That baby hippo is one of the cutest things I've ever seen. Too bad they grow up to be so mean. Aw... Hippos are my favourite animal anyways... but that baby is so stinkin' cute. Because he didn't have enough guts to do it! Cutest picture ever! Love it. are baby hippos really that little? your story of the dancing kiddo reminded me of this video from way back in the day, not sure if you have seen it before or not, but it makes me giggle every time! "are baby hippos really that little?" 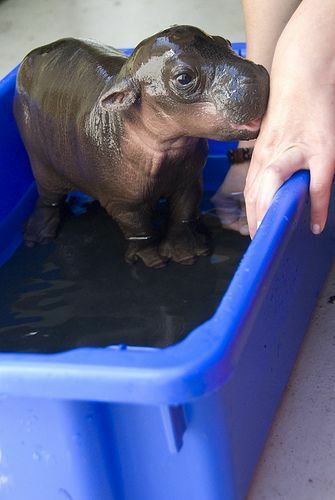 No, not a regular hippo, that is a baby pygmy hippo. Its so cute, I wish they stayed that size. That baby hippo just makes me smile! Love it! i want that baby pygmy hippo more than world peace right NOW! 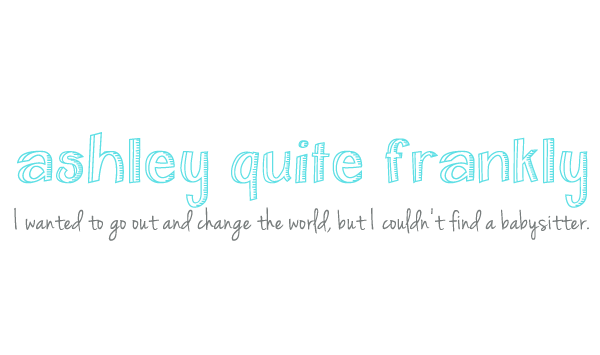 Completely off topic of this blog, but I thought it would be the quickest way for you to see it. Have you seen this: http://www.debontherocks.com/?p=764 Bloggers linking up for a "Love the Gulf" campaign, sorta. I thought you were a Gulf Coast girl and might be interested in reading some of it.